Whether you have a newborn, toddler, preschooler or student in your life, this article will be of interest if you want to learn a magical way to create connection with a child of any age. Even more, if you have a five year old or a child who will be five before October 15th, you will likely be especially interested in learning how the newest literacy and education research is contradicting the kindergarten status quo. My research cites that the developmentally appropriate practices and environments for five year olds, which most kindergarten teachers have long observed and many wish to continue to observe, are no longer the norm in most of today’s kindergarten classrooms. If you are one of the parents anxiously anticipating the kindergarten screenings coming up in April, you may already have read articles about kindergarten readiness and may be conscientiously trying to prepare your young ones for what will be expected of them. Letters, numbers, colors and shapes used to be what children learned in kindergarten. Those kindergarten lessons have now been pushed down to PreK, a new grade invented to prepare children for the new kindergarten.This has been done because the kindergarten year is now being spent on curriculum that used to be taught in first grade. Sadly, we are losing some of our best kindergarten teachers because their integrity will not permit them to teach kindergarten in a way they are now being required to. As a former family child care provider who has over 50,000 hours of experience caring for children ages two through ten and has studied young children’s developmental and emotional needs extensively, I have profound respect for early childhood education and educators. Therefore, it is incomprehensible to me that those practices deemed developmentally appropriate for five year olds while they are at child care or preschool can suddenly be ignored and even contradicted for the five year olds attending kindergarten. How can anyone justify restricting their movement for many hours a day, expecting them to do tasks that many are not yet developmentally ready for, and then undermining their self esteem by letting them know they are not meeting expectations and/ or punishing them for acting like five-year olds? Young children’s kindergarten experiences set the tone for how they see themselves as learners and create their beliefs about their abilities to learn to read, write and calculate. Kindergarten doesn’t have to continue in this direction. While we can’t go back to all of the old kindergarten ways, [technology has forever changed the face of childhood and education] we can go forward with parents and educators working together to recreate kindergarten into the most nurturing, developmentally-appropriate learning environment possible. When we begin to use our new knowledge of brain development and how student-teacher relationships affect learning as our guide to developing kindergarten curriculum we can create one that will support kindergarteners in building a strong foundation for the rest of their education. Happily, for the children who are at the beginning of their learning journey, we don’t have to wait for those much needed changes to kindergarten curriculum to make their school experience of learning to read more joyful and successful. I am excited to share with you that the Book Fairy Pantry Project has become a community partner with the 1000 Books Before Kindergarten Program. The concept is simple; read aloud 1000 books between birth and kindergarten. Reading even 3 picture books a day for a year is 1,085 books. This measurable goal of reading aloud 1000 books is absolutely possible over five years. No matter what age your pre-reading children are when you get this information, it is possible to reach the goal of reading 1000 books before first grade, if not by kindergarten. If your children are already in kindergarten, reading 3 picture books a day as a way to reconnect after school will not only strengthen their emerging literacy skills, it will recharge your emotional connection. I recently asked a kindergarten teacher, “How much difference would it make if your students arrived at kindergarten having already heard 1000 books?” Her eyes widened and she said, “1000 Books?! That would be a kindergarten game changer!” Reading 1000 books to our pre-reading children is the “game changer” that will send them to school with the strong pre-reading literacy foundation and the strong parent-child connection they will need to help them better cope with a kindergarten curriculum not designed with developmentally appropriate practices as a priority. What we do at home can change how they will do at school. I traditionally feature an outstanding children’s book that matches the theme of my article. However, since this article is about supporting parents in reading 1000 books before or during the kindergarten year, I want to share not one, but two exciting new books to both inspire and inform parents, caregivers and teachers about how we can make our reading aloud count the most for the children we read to. Bookworm Babies: Read. Converse. Nurture. (An easy-To- Follow Handbook Designed by Teachers for the Parents of Infants, Toddlers, and Preschoolers) by Kimberly Zimmer Aulenback and Dawn Ohanian Tringas. Because “ there is so much more to book-sharing than reading” these authors coach parents, grandparents, relatives, friends and caregivers in the art of “conversational reading” as a way to make connections from the words and pictures on the page to the things children experience in their world. When babies, who are read to from birth, see a book, they already know it will be a feast for their senses: they will be held, they will hear their favorite voices, they will see pictures and they will feel loved. What baby wouldn’t love books? 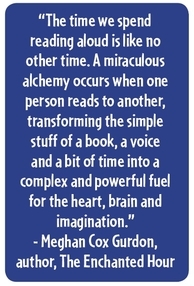 The second book I want to feature is, The Enchanted Hour: The Miraculous Power of Reading Aloud in the Age of Distraction by Meghan Cox Gurdon. James Patterson, international best-selling author said, “ It’s not the school’s job to get our kids reading, it’s our job, and it’s a wonderful, magical act of love and caring.” Reading aloud together is so much more than something we should do to prepare our children to one day learn to read. Read-aloud time is connection time. Opening a book with your child creates an instant intimacy as you enter the world of story, hand in hand, heart to heart, sharing an adventure together. When we do our job of teaching children to love books, by reading 1000 books aloud to them when they are little, it is much easier for teachers to do their job of teaching students to read when they are big. Pam Leo, is a family literacy activist, the author of Connection Parenting, and a new poem, Please Read To Me. Her enduring love of children's books, her passion for literacy, and her commitment to empowering parents, are combined in her new role as the founder of the Book Fairy Pantry Project, whose mission is "No Child With No Books," because "Books change children's lives... For good."